Clip from KOIN TV segment that aired last night. Alameda resident Mark Holzmann says he was the victim of harassment, vandalism and an expletive-laced tirade following a traffic incident on Tuesday night. Holzmann emailed me yesterday to share his version of events. 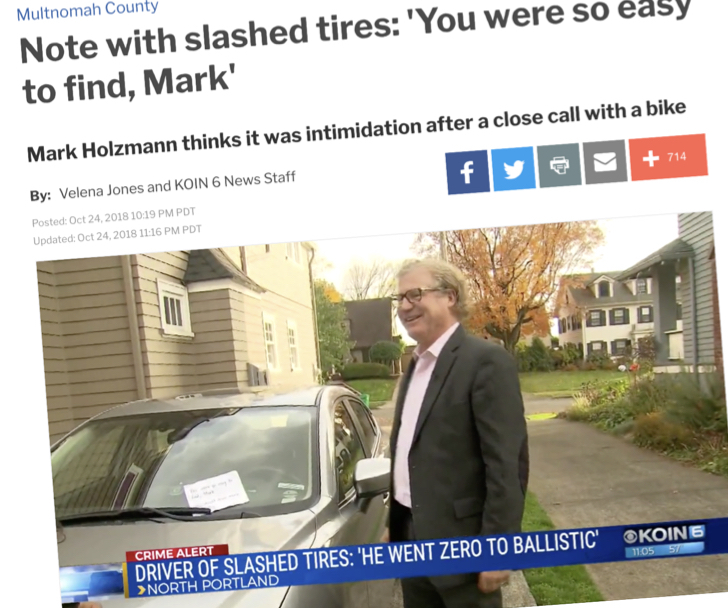 Today I noticed Holzmann’s story was published as an opinion piece in The Oregonian and the subject of a local TV news story last night. We’ve also heard he’s posted the story on Nextdoor. A few nights back, Oct 22, I was on my way to a Blazer game at the Moda Center. My tickets included parking in Moda Center garage, Bonus!! It’s about 6:00 pm with light traffic. I took the route where I picked up N. Vancouver Ave at N Russell Street and headed South to the front entrance of the parking garage. The approach to the front of the Parking Garage is very confusing with many intersections, Bus only lanes, Bicycle lanes and all sorts of merging lanes. While merging and turning to my right I did not see a Bicyclist, and from what I can tell I turned in front of him and he didn’t like that, I may have cut him off. I proceeded slowly to the front of the Parking garage. 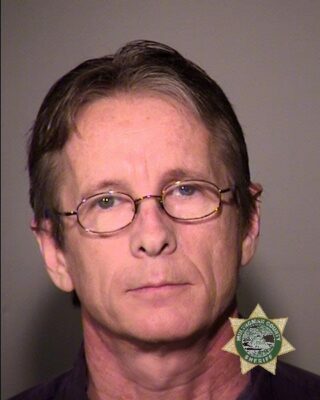 The Bicyclist follows me in to the entrance of the Moda Center still in a tirade, the parking attendants are looking at him and can’t believe it. This man is still acting like he may explode, the expletives still spewing forward, screaming “didn’t you see me at the top of his lungs.” Still laced with expletives! I give my ticket get a receipt and pull into the garage. The bicyclist rides off screaming, I find a place to park, go to watch the game. I tell my story to my friends I am meeting about the crazy bicycle guy, watch the game, (we lost in overtime) and then go home. Roadway assaults between motor vehicle operators and people on bikes and foot happen all the time. They usually don’t end well. This one did. At least for the victim. This story is part of our Collision Chronicles, an ongoing series to shine a light on the steady stream of scary street interactions we hear about but that you probably won’t see covered in the news. I never thought I’d be emailing anyone about something like this, but it finally happened to me. I was assaulted by a driver on my short morning commute, Monday 8/29, around 7:20 am. I was following a driver from the MLK/Skidmore light west down Skidmore and he was driving erratically, slowing as if he was going to turn right several times. I thought he might be a uber/lyft driver, after the 2nd time I tried to go around him and he sped up, obviously taunting me and yelling, “Why the F are you riding my bumper?!”. 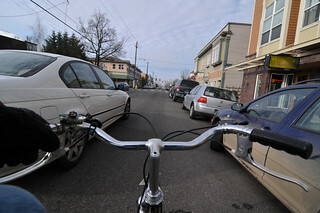 There’s a reason bicycle operators are legally defined in Oregon as “vulnerable roadway users.” We use the streets without all the steel and glass that protects others. 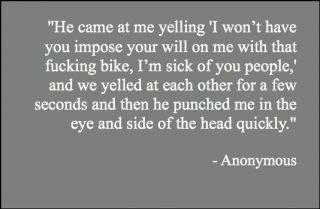 And that’s why we take harassment and road rage so seriously. Even when people think they’re just pulling what they think is a harmless stunt like revving an engine or “rolling coal,” they often have no idea just how much their actions hurt and scare us. 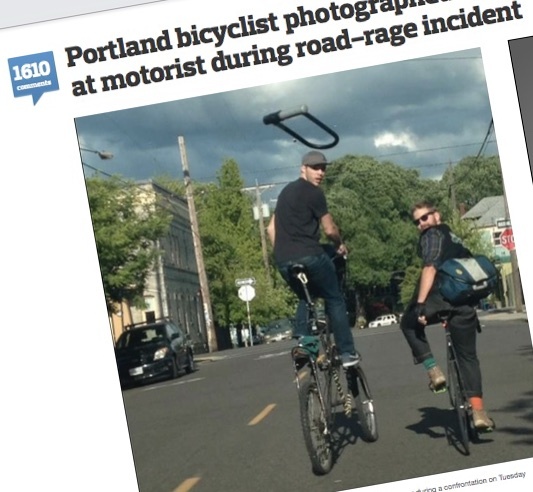 BikePortland reader Reed Andrews says he was the victim of a “prank” last night that left him trembling with fear and the aggressors laughing in delight. 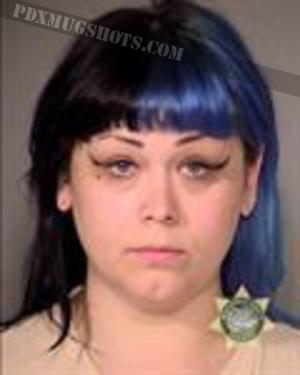 Woman accused of road rage on North Williams last night. An interaction between road users on North Williams Avenue during rush-hour last night turned ugly when a woman driving a car physically threatened a woman who was cycling by swerving her car into the bike lane and then chasing her into a nearby restaurant. 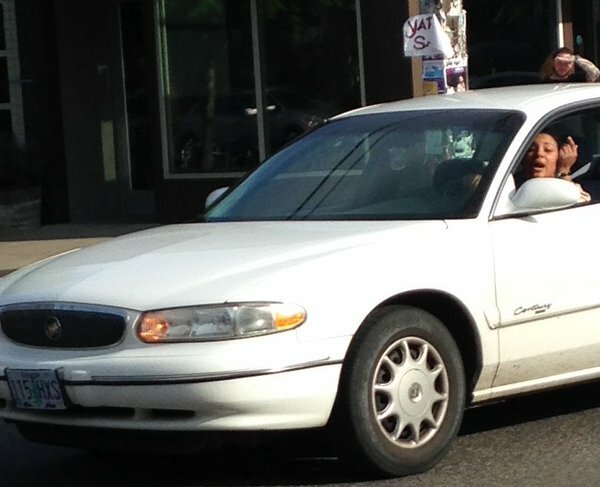 It started around 5:15 pm when Piedmont neighborhood resident Jessica Roberts saw a woman in a white sedan using her cell phone. 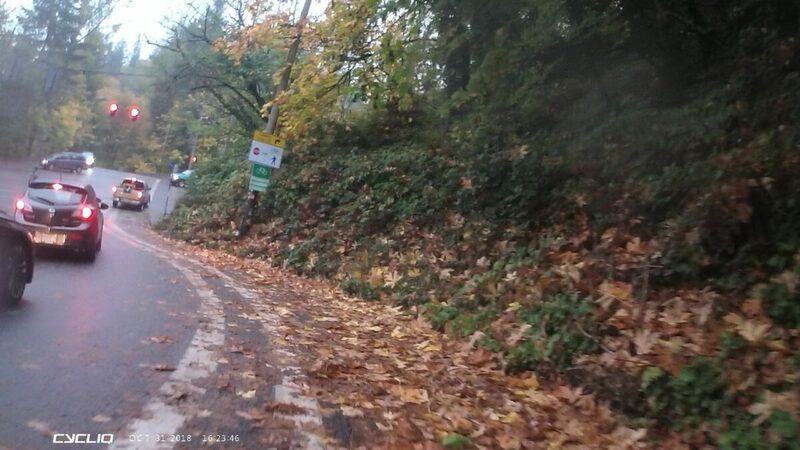 Roberts told us this morning she first saw the woman on her phone when her car passed her while she was biking in the bike lane near North Stanton (Dawson Park). As usual during the evening rush Williams was completely backed up with auto traffic. Upon passing by the woman’s vehicle a few seconds later (near Fargo Street) Roberts looked at her and yelled, “That’s illegal!” In response, the woman, “Looked up and just exploded with rage,” Roberts says. Image of the altercation taken by a witness. 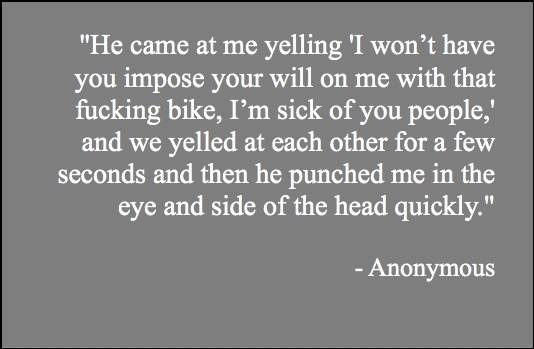 Menacing behavior from motor vehicle users is something that happens all too often. It can take many forms and has varying levels of severity — from annoying and almost comical (like yelling, revving an engine or “rolling coal“) to serious and life-threatening behaviors like aggressive passing and throwing objects at another person. Reader Jason K. just shared his experience. And we’re sorry to report it was the latter. Jason says he was passed so closely by a man driving a car that the rear-view mirror might have made contact. After that unsettling experience, Jason caught up to the man at a train crossing, tapped on his window, and tried to talk with him. It went downhill from there. Fast. It all happened this past Saturday afternoon at the intersection of SE 11th and Division. Jason shared a video with us that was taken by someone in a car who saw the situation unfold. You know the drill. A provocative photo and/or incident illustrates the long-running “bikes vs cars!” narrative and then all heck breaks loose. Comment sections light up, the BikeSnob takes his cut, then the story gets piled onto our collective mental legacy about how we get along — or don’t — out on the streets. Over the years I’ve gotten tired of these types of stories. The fact is, people yelling at each other and doing emotionally-charged things to each other is not news. 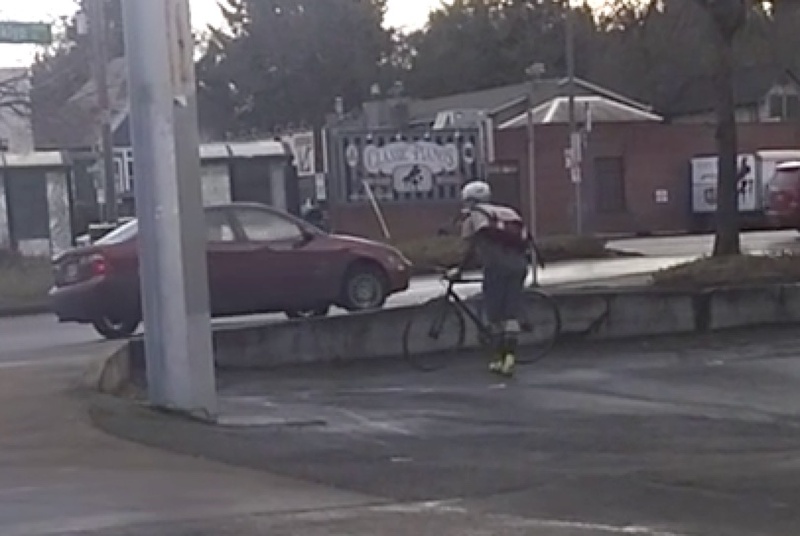 It might be worth publishing if you’re in the content business, but if you ride a bike everyday you’ll know that jerk behavior — on both sides of the windshield — happens all the time. Given how much attention the recent U-lock throwing incident got (over 1,600 comments on OregonLive! ), I didn’t even plan to post anything about it.